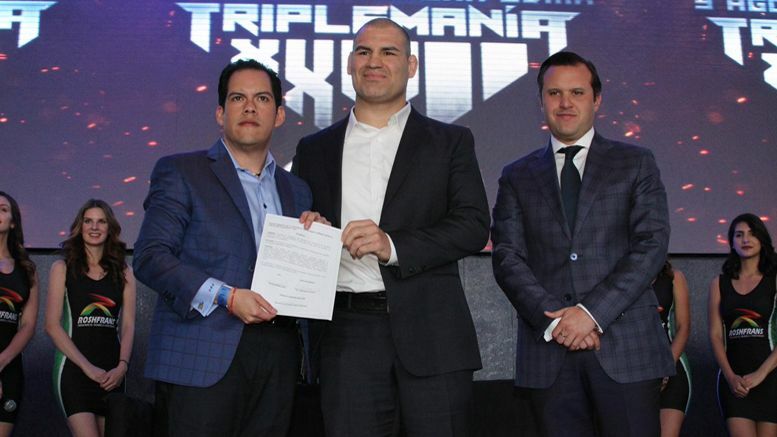 Former two-time UFC Heavyweight Champion Cain Velasquez has signed with Mexican wrestling promotion AAA and will be appearing at their upcoming Triplemanía XXVII event. Velasquez was unveiled as a AAA competitor at the Triplemanía press conference in Mexico City earlier today, according to Luchablog. Cain was then accosted by AAA stars Psycho Clown, Texano and Pentagon Jr … and subsequently challenged to a match by all three. As you may recall, Velasquez spent time training at WWE’s Performance Center in Orlando in July of last year. “I’ve been a fan of the sport since I was a little kid, and now I get to participate in it,” he told WWE.com at the time — a sentiment he reiterated at the Triplemanía press conference. Cain Velasquez’s last fight in UFC was a losing effort back in February. Before that, however, it was in 2016 against Travis Browne. He won that fight in the first round via knockout. Triplemanía goes down on August 3rd at Arena Ciudad in Mexico City. Check out AAA’s Valasquez hype video below.